In 1945, a US Air Force pilot claimed to have made a remarkable discovery while flying a mission over China--an enormous white pyramid. As he described it, "I banked to avoid a mountain and we came out over a level valley. Directly below was a gigantic white pyramid. It looked like something out of a fairy tale. It was encased in shimmering white. This could have been metal, or some sort of stone. It was pure white on all sides. The remarkable thing was the capstone, a huge piece of jewel-like material that could have been crystal." Aside from a questionable photo that was later published in the New York Times, no evidence of the pilot's pyramid was ever discovered. (And the US Air Force didn't even exist in 1945.) But the story managed to call attention to a little known fact. 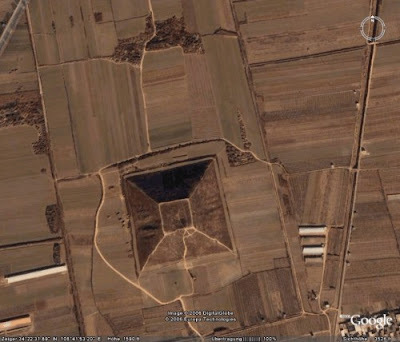 To the west of the Chinese city of Xi'an lie over one hundred pyramids. Even today, little is known about them. In fact, because they were located in "forbidden zones," the Chinese government wouldn't verify their existence until 2000! Though there are quite a few websites out there that would have you believe that the pyramids were built by aliens, the structures are actually burial tombs for ancient China's nobility. Yet very few of them have ever been excavated, and even archaeologists can only speculate about the wonders that lie inside. One of the most magnificent belonged to the first Chinese emperor, Qin Shi Huang (builder of the first Great Wall and all-around tough guy). In 1974, we discovered what lies OUTSIDE his pyramid mausoleum when a farmer stumbled upon his secret army of Terracotta Warriors. (If you don't know about these you REALLY must check them out.) But the inside of his tomb has never been opened. However a writer of the time claimed the pyramid contained an exact replica of the Emperor's kingdom, complete with tiny palaces, mercury rivers, and jewels to represent the heavens. If you could make it past the boobytraps (crossbows rigged to shoot intruders), it would be an amazing sight to behold! Wow!!!! I hope the chinese government lets an archeologist uncover it in my lifetime because im very intrigued! thanks kirsten! That's awesome! I've heard of that pyramid in something about the Wonders of the World. I'm not sure if I even still have the book. just wondering what does XD mean......lol i do not catch on so quickly to these things. MinniemouseloverXOXO: XD is the face of a person who is cracking up. So says Wise Old Barn Owl Hazel. Wise Old Barn Owl Hazel enjoys spelling it xD. So basically it means Hee Hee or Just Kidding. Those things are so cool. I would love to be able to look through a place like that. It would just be awesome. Wow! Thats amazing! I heard of it somewhere but iam not sure where. Henchman: how did a bunch of guys with handtools build all this? Riley Poole: Yeah, the aliens helped them. The first thing I thought of when I read this was "The Empress's Tomb". Anyone else? Can you please tell us what the new book is called? Please??? I know that Kiki Strike has a big thing for secrecy and all that, but I want to get your new book for my BDay. Anonymous: Thanks for asking about the new book, but it's not even completely finished yet! It will be a little while before it's out. And you guys will be the FIRST to know the name! i went to china in april on an exchange program. we took a train through shanxi province to xi'an, and i saw a lot of those "pyramids" on the way. I wasn't close enough to see wether they were man-made, but they were obviously not made of any crystal... unless they have been covered with dirt and plants. mwahahahaha.